Now available! Communicate effectively with your management, your staff, and your patrons. Included: 11 power communications that demonstrate your value, your professionalism, and your accountability. Full description below. 1 copy: $80; 2 copies: $152; 3 copies: $216; 4 copies: 280; 5 copies: $340. Books must be mailed to the same address. Communicate effectively with your management, your staff, and your patrons. Create professional documentation: policies, guides, reports, and other types of documents. Own and display your expertise. Brand your library and promote your value. Use metrics to make your case. Report your goals and accomplishments. 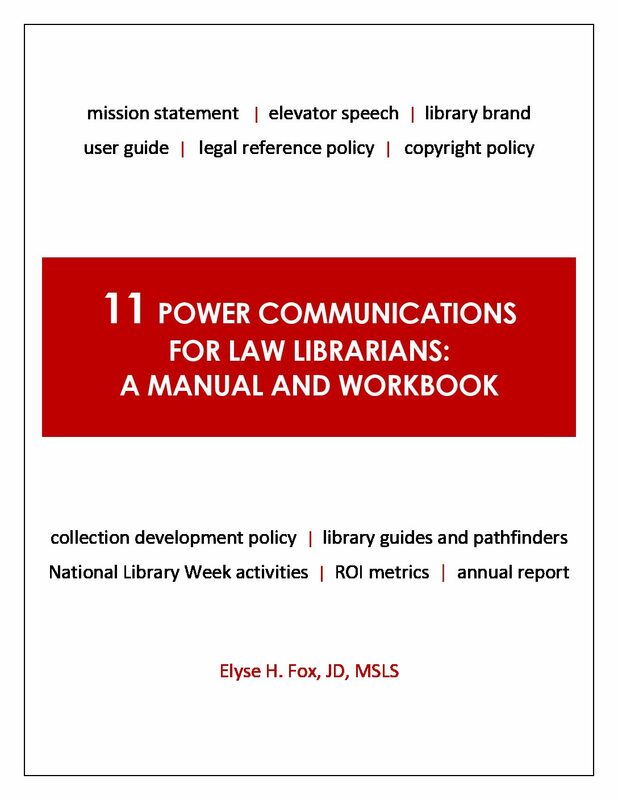 Included in our new book: 11 types of power communications, plus guidelines and workbook exercises. Author: Elyse Fox, BA, JD, MSLS. Ms. Fox has worked in private, academic, and membership law libraries for 40+ years and writes frequently on law library management and legal research. She previously practiced law in Chicago and Boston. She also taught legal research to attorneys and law students..
Price includes priority shipping and handling. ISBN: 978-0-941991-60-1. 143 pages, 8 1/2 x 11, coil binding.